The London Olympic Stadium is a completely unique setting that we are thrilled at Fresh Locations to be able to offer to our clients, and we can’t wait to see the results of many a fantastic location shoot here. The London Olympics of 2012 has come to occupy a warm place in the nation’s hearts. From the staggering, Danny Boyle-directed, opening ceremony to the spirit of the legions of happy volunteers. Not to mention the events themselves and that huge heap of gold medals. The architecture and gardens have been received to huge critical acclaim and, at the heart of it all, sits the Olympic Stadium itself. Today it makes for a truly unique shoot location and Fresh Locations are extremely proud to be its sole location agency – it’s a fantastic addition to our diverse location library. The vibe at the stadium is slick, glossy, futuristic - space age even - think Gattaca and 2001, A Space Odyssey. It's a look that works particularly well for advertising shoots or music promos that need a lux, aspirational slant. One critically acclaimed dystopian TV series has already made use of its bold modern aesthetic. It's such a huge space that Fresh Locations agency have presented it in 3 manageable chunks on their website. We pride ourselves on our bespoke and tailored service so do talk to us about your specific needs. Firstly the stadium itself, designed by Populous, is a sports venue on the grandest scale. With fin-like white tubular-steel floodlights and an iconic silhouette, it’s more sculpture than stadium, creating an iconic backdrop for any film or photo shoot. Available spaces include both pitch and pitch-side, running track, stands and tunnels, the locker rooms and much more. And with removable branding, it can double as anything from office to airport. Next up are the venues... 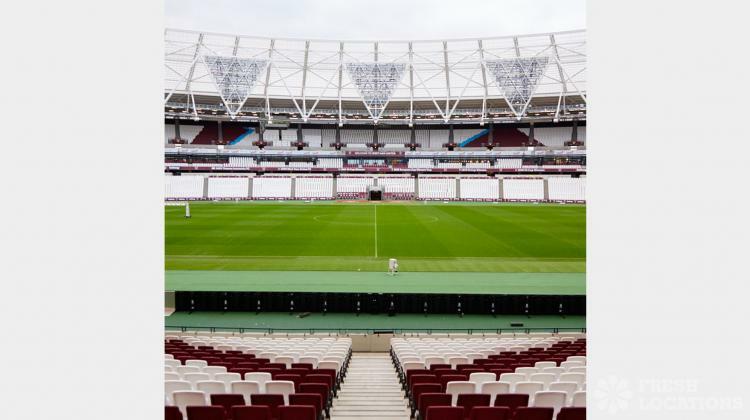 The Olympic Stadium offers a diverse collection of stunning bars, restaurants and meeting spaces with many stunning views of both the pitch itself and the City of London. The looks vary from industrial to high-glamour – all great destinations for stills shoots, filming locations as well, of course, as ideal settings for product launches and special events. Last but absolutely not least, are the service areas that can double as a wide range of spaces – everything from shopping centre, to office to airport (not least because of the removable branding) with numerous useful corridors, escalators and lift areas. Catch Channel 5’s mockumentary ‘Borderline’ to see this in action.